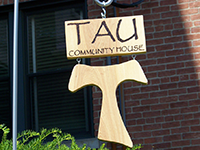 The Tau House offers a home away from home to our participants. Volunteers live in community in a simple lifestyle at Tau Community House, located in St. Bernard, Ohio. Men and women reside on separate floors. Dormitory-style bathrooms are on each floor. The remainder of the House features a Chapel, a large dining room for shared meals, a kitchen, two living rooms, laundry facilities, and a basement with space for recreation. Please take a look! Mass is available daily next door at St. Clement Catholic Church, and the Tau House is ½ block from the Metro Bus Line. Food is provided for community meals and linens are available for beds and showers.